Why Continue To Throw Money Away When You Can Invest In Your Own Home? With the rates of rent increasing, more and more people are starting to see the perk in purchasing their own home. That being said, the perfect opportunity for you to do the same is here! This super cute property for sale at The Apple Valley Lake offers a lot of desirable features and would likely have a monthly payment that's cheaper than your current rent! Just a 2 Minute Drive To Sutton Beach! appears to be on the outside. Highlighted by a floor to ceiling fireplace, friends and family will love the vaulted ceiling living room filled with natural light, the adjoining dining area and charming galley style kitchen that includes major appliances. This home also includes a main level family room off the dining area, a convenient main level laundry / mud room, and relaxing covered front porch that's perfect for propping up your feet after a long day of hard work. Located in the East Knox School District in Orchard Hills Subdivision, this Apple Valley Lake home offers an attached and oversized garage as well as a yard barn for added storage and is priced to sell quickly at just $100,000. 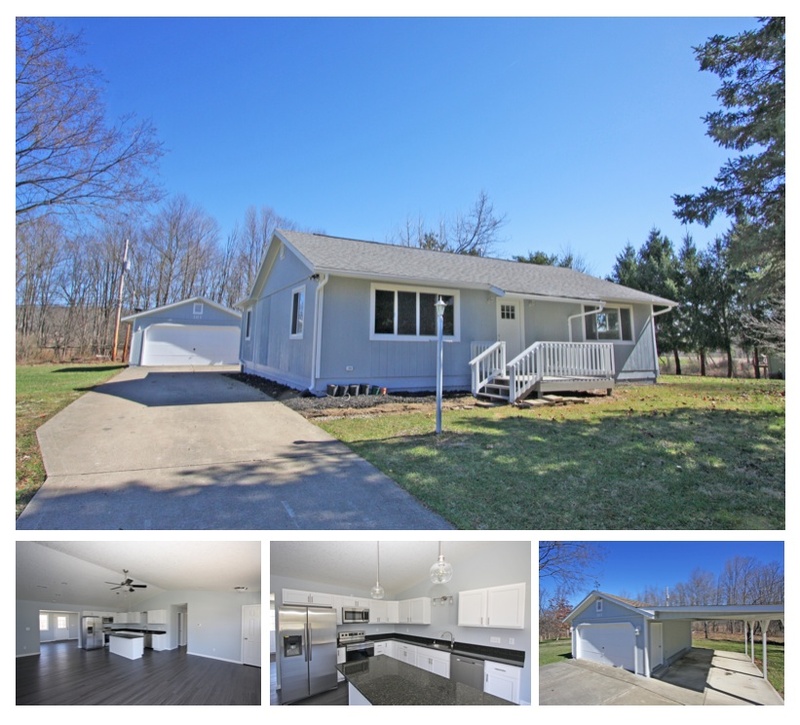 Click here for more information on this 1445 Apple Valley Drive home for sale at The Apple Valley Lake in Howard, Ohio, 43028. To find all available homes for sale at The Apple Valley Lake, click HERE. Start off your day by hovering above the East Side Boat Launch and Spillway of the Apple Valley Lake and find yourself flying towards a stunning sherbet horizon in the distance. 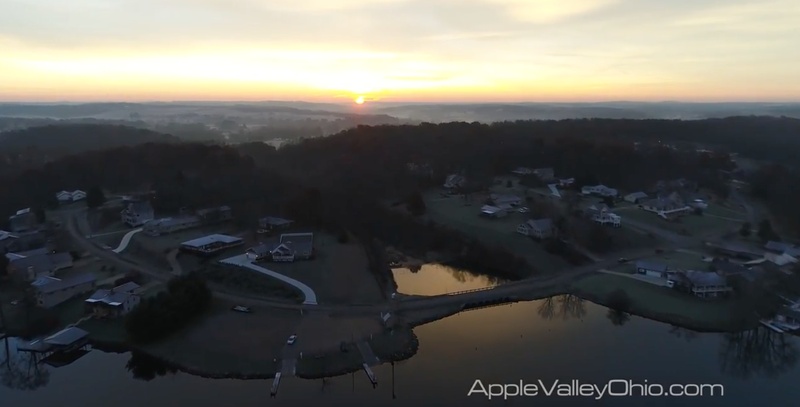 This custom drone footage captures a gorgeous reflection of the sunrise of the lake and captures a unique birds eye view of surrounding Apple Valley Lake real estate. Whether you're an Apple Valley Lake resident or someone who lives to see the beauty in season change and love watching breathtaking sunrises/sunsets, this video is for you. If you love the Apple Valley Lake, consider making it your new home. Click HERE to find Apple Valley Lake homes for sale in Howard, Ohio 43028. Situated on a gorgeous oversized wooded lot on Winesap Circle is a nicely updated cottage for sale at The Apple Valley Lake. This property would be a fantastic weekend retreat or vacation home, featuring an open great room floor plan that allows for lots of natural light in the vaulted living room, adjoining dining area and lovely updated kitchen filled with white cabinetry and modern appliances. This home also features convenient main level laundry and a nice sized bedroom. Along with the many updates to this property, the detached oversized 2.5 car garage also features a bonus room. Kick back and relax on the front deck and take in the gorgeous Apple Valley views surrounding you. This property is available for immediate possession and is an absolute must see with its many improvements throughout. Priced to sell at $100,000. Click here for more information on this 675 Winesap Circle home for sale at The Apple Valley Lake. If you love The Apple Valley Lake, check out homes for sale at The Apple Valley Lake, HERE. Take a tour of the property by clicking the 3D immersive Matterport tour below. It’s that time of year once again when they lower the water level at the Apple Valley Lake down from what is known as full pool to a much lower level. They do this each year before the cold winter weather arrives and before the lake water freezes. There are several reasons for lowering the lake but the most important one is to protect the boat docks and sea walls from damage from the ice and ice shifting. Another benefit is that property owners can make repairs, upgrades or build boat docks and sea walls that would otherwise be nearly impossible when the lake is at full pool. 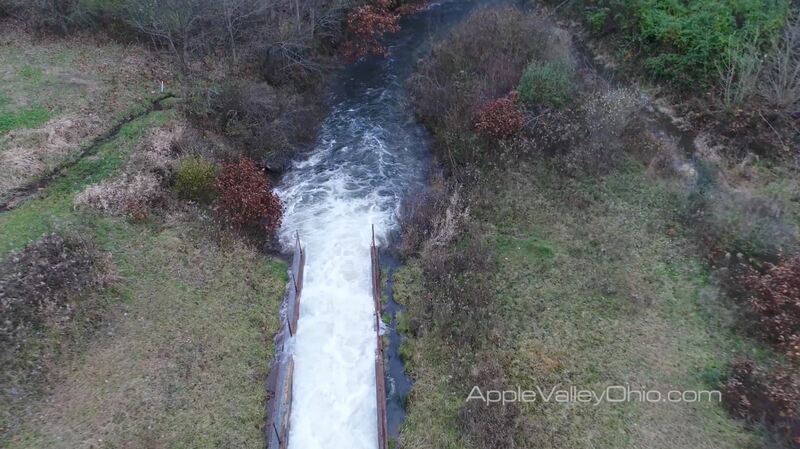 We have shot a few videos of the initial lowering of the Apple Valley Lake in the past but this is our first time using our drone. The elevated birds eye view from above the lake offers a unique perspective especially when they opened the water valve and you get to see the initial lake water surging out. People have asked us “Where does the water go” and the water actually flows through the Little Jelloway Creek and it will eventually find its way into the Kokosing River. 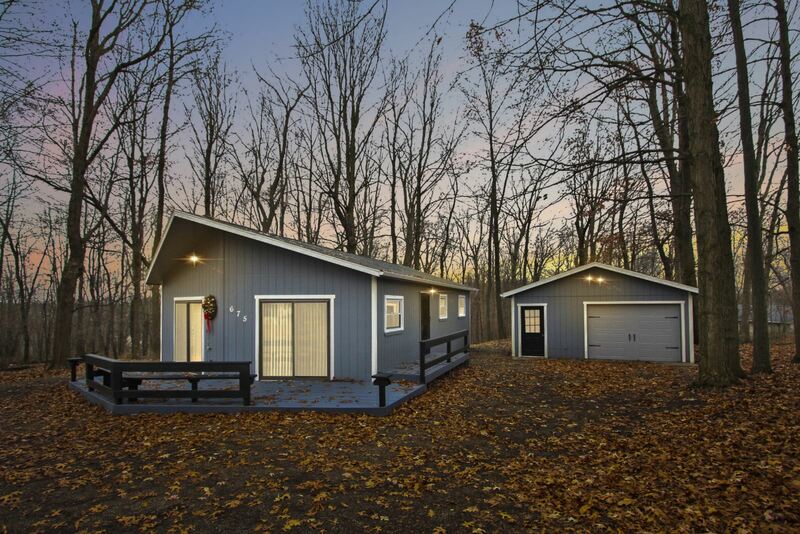 Click HERE to view homes for sale at The Apple Valley Lake in Howard, Ohio, 43028. This custom drone footage was brought to you by Sam Miller of REMAX Stars Realty 740-397-7800. Are you looking for a ranch home at The Apple Valley Lake? This custom tailored search provides you with every Apple Valley Lake ranch home for sale in the entire Knox County MLS. Make sure you bookmark this page because it is updated with every ranch home that is listed for sale in the Knox County MLS as they come on the market. Click on any listing or photo below to see more information on any of these listings. View this remarkable drone video featuring dozens of aerial views and a unique perspective of the East Knox School and Football Stadium. The East Knox School District serves the majority of the Apple Valley Lake, Martinsburg, Bladensburg and Howard, Ohio. The East Knox School District covers an area of 144 square miles and services the communities of Howard, Apple Valley, Bladensburg, and Millwood. The district employs a staff of 82 excellent teachers and administrators, with enrollment at a little over 1000 at the end of the 2016 school year. The district is ranked highly in Ohio, given a 7 out of 10 by GreatSchools.org for testing results and boasts a 95.9% graduation rate over the last 5 years. They have received an Excellence Rating for the Ohio Public Schools. This impressive school features some of the best athletic facilities in the area for their students and fans. Facilities include a fantastic football field, baseball and softball fields, track and basketball court. East Knox Elementary School also received a high rating on Niche.com. GreatSchools.org also rated East Knox Middle School highly, giving it a 9 out of 10 rating for test scores and a perfect 10 for student progress! Are you looking for a home in the East Knox School District? Search below or view additional homes here. Apple Valley Lake Real Estate - In the Palm of Your Hands! Apple Valley Lake Real Estate is now available in the palm of your hands! Find Apple Valley Lake and the entire Knox County Ohio real estate listings on your Apple or Android devices! Our ALL NEW APP is free! Get instant and accurate information about all homes available in the the entire Knox County Ohio MLS. This new app is your go-to tool for buying a home in Apple Valley. It lets you chose what matters to you so you only see homes that fit your needs. Use your GPS and find all the homes near you so you can drive by or walk through the neighborhood! Have questions while using the app? You can call, text or email your agent right from the app! You can also send listings to your friends! Finding the perfect home in Apple Valley has never been more convenient, and fun! Visit www.applevalleyohio.com/app for more details. 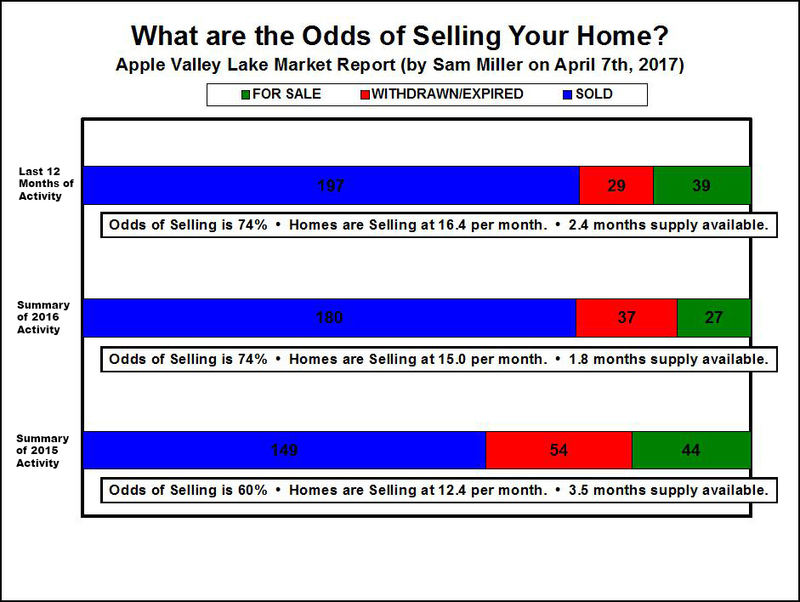 Let's take a look at at the real estate market for Apple Valley Lake. Currently there are 10 sales pending in the market overall, leaving 29 listings still for sale. The resulting pending ratio is 25.6% (10 divided by 39). So you might be asking yourself, that's great...but what exactly does it mean? I'm glad you asked! The pending ratio indicates the supply & demand of the market. Specifically, a high ratio means that listings are in demand and quickly going to contract. Alternatively, a low ratio means there are not enough qualified buyers for the existing supply. Taking a closer look, we notice that the $100K - $150K price range has a relatively large number of contracts pending sale. We also notice that the $150K - $200K price range has a relatively large inventory of properties for sale at 9 listings. The median list price (or asking price) for all properties in this market is $200,000. A total of 76 contracts have closed in the last 6 months with a median sold price of $162,525. Breaking it down, we notice that the $150K - $200K price range contains the highest number of sold listings. Alternatively, a total of 15 listings have failed to sell in that same period of time. Listings may fail to sell for many reasons such as being priced too high, having been inadequately marketed, the property was in poor condition, or perhaps the owner had second thoughts about selling at this particular time. The $150K - $200K price range has the highest number of off-market listings at 5 properties. What are the odds of selling your home? The next chart shows a breakdown of the last 12 months, compared to 2016 and 2015. Let's take a look now at the real estate market for Apple Valley Lake Lots. Currently there are 7 sales pending in the market overall, leaving 72 listings still for sale. The resulting pending ratio is 8.9% (7 divided by 79). So again you might be asking yourself, that's great... but what exactly does it mean? listings. The median list price (or asking price) for all properties in this market is $4,500. A total of 32 contracts have closed in the last 6 months with a median sold price of $3,450. Breaking it down, we notice that the $3K - $5K price range contains the highest number of sold listings. Alternatively, a total of 26 listings have failed to sell in that same period of time. Listings may fail to sell for many reasons such as being priced too high, having been inadequately marketed, the property was in poor condition, or perhaps the owner had second thoughts about selling at this particular time. The $3K - $5K price range has the highest number of off-market listings at 17 properties. Want to learn more about the market in Apple Valley Lake? Download our free reports for Apple Valley Lake and Apple Valley Lake Lots today! 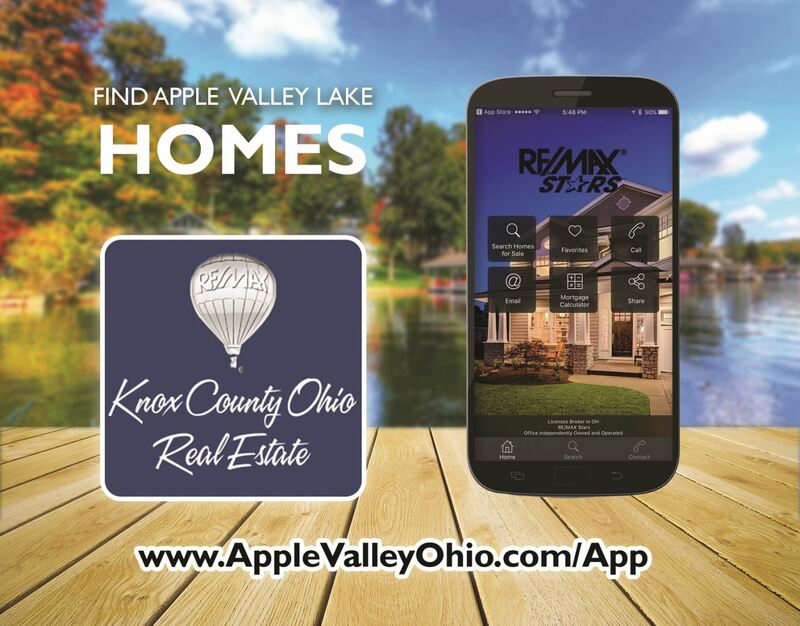 This brand news real estate app for iPhone and Android smartphones is totally free and gives you instant access to all of the available Apple Valley Lake homes for sale in the entire Knox County Ohio MLS. This real estate app will give you a significant advantage because you won't have to wait for a real estate agent to complete manual home searches for you and then email you the results. You can do "LIVE" active searches instantly 24 hours a day using your smartphone while you are on the go! You can also do custom searches that are geared around the home locations and price ranges that you are interested in. The benefit to you is that you won't have to sort through hundreds of homes that aren't remotely close to what you are looking for because you can fine tune your search parameters this app and your viewing profile can be highly customized by you using the "Filter" feature. You can also use the GPS that is built into your smartphone and take advantage of our Map home search feature and you can view available Apple Valley lake homes that are located near you. This search feature is extremely helpful especially when you are walking or driving around the Apple Valley Lake community and you find an area that you would LOVE to live in. Ideally located within 2 minutes of Sutton Beach near the front entrance of the Apple Valley Lake. This home has been extensively remodeled and the results are truly stunning and features a vaulted great room design with 3 bedrooms, 2 full baths, a bonus family room in addition to the huge great room that combines a large living room, dining and one of the most stylish kitchens I have seen in this price range!!! The kitchen features gorgeous white cabinetry with soft close sliding drawers, granite counters plus a huge center island - this kitchen will make you say "WOW". The private master bedroom suite has wonderful natural sunlight, a private bath with solid surface shower plus a walk in closet. This is n ideal home especially for those who desire single level living and the conveniences of having everything on the main level including the laundry. The setting and lot are very nice and the lot is level and easy to care for plus there is a full sized 2 car garage with a concrete drive plus a bonus covered space. I believe you will be impressed with the look, feel and design of this home especially with a listing price of only $160,000. 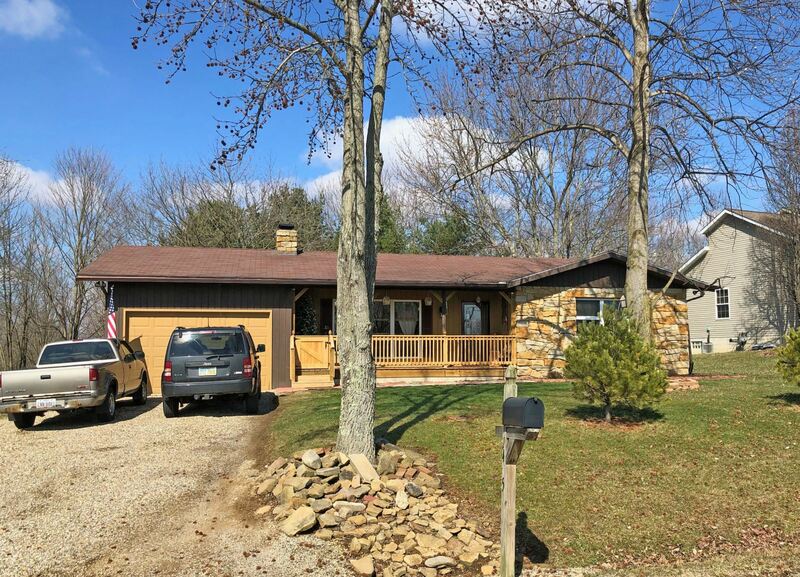 Click here for more information on this 181 Hasbrouck Circle home for sale at The Apple Valley Lake in Howard, Ohio 43028.